2017 marked a record-breaking year for Lewis Hamilton as he became only the fifth driver in history to win more than three World Championships, joining the motor racing greats. 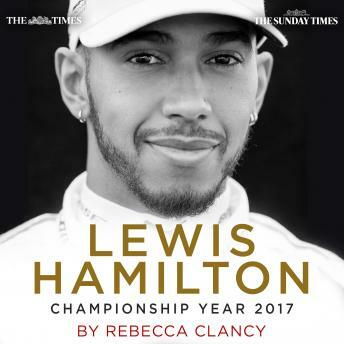 Through in-depth race reports and analysis from Times writers Rebecca Clancy and Mark Hughes, this unauthorised audiobook edited by Clancy will relive that achievement. The list of Hamilton's accolades is long and distinguished. The Englishman has finished on the podium in more than half of the grands prix he has contested, started on the front row more times than any other driver and is the only British quadruple world champion. Such is the extent of his speed, ferocity and tactical skill on the track that the 1996 world champion Damon Hill has called him "one of the greatest, most talented drivers" to compete in the sport. Yet despite the countless awards and records, the 2017 season was full of challenges. From extreme weather conditions in Shanghai to opening lap mayhem in Singapore, there was little opportunity to take his foot off the pedal, especially with the constant threat of Sebastian Vettel, his keen Ferrari rival. Over the course of the season, The Times and The Sunday Times have followed every race, team and driver competing on the Formula One circuit. With unparalleled expertise and access, this audiobook will give a unique insight into the season, analysing Hamilton's performance and celebrating his astonishing success.